Deep voices of the giants chant in the hills and forests. Red-cloaked cultists gather to perform their unholy rites, and howling tribes of dust goblins ride out of the Western Wastes to sack villages and towns. But you do not fear these things. You are a hero of Midgard—and by your skill, strength, luck, or the favor of the gods, you will become a legend. 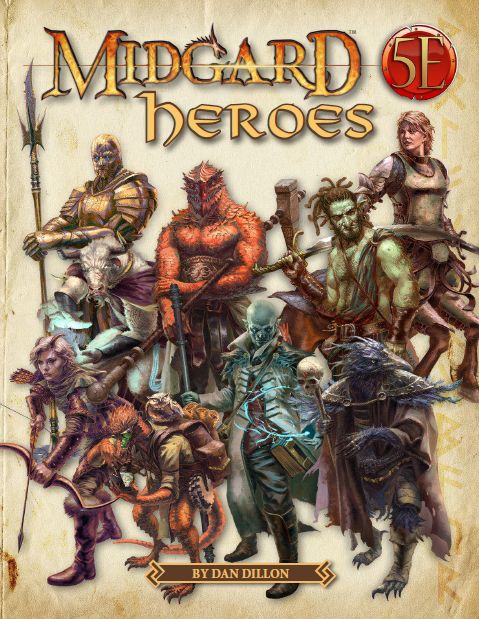 Midgard Heroes gives you everything you need to play in a 5th edition campaign set in the Midgard Campaign Setting. Rules for playing new PC races: centaurs, dragonkin, gearforged, kobolds, ravenfolk, shadow fey, trollkin, and more! 7 new backgrounds: Corsair, Darkling, Fey-Touched, Nomad, Raider, and more! Only magic and the warmth of hope keeps lights aglow when dread things prowl and the priestly wardings shake, bent by hideous demonic rage. In this dark time, new heroes must arise to claim the crowns of Midgard and restore the jewels to her scattered thrones. New heroes must lead a return to glory. This pdf clocks in at 30 pages, 1 page front cover, 1 page editorial/ToC, 1 page SRD, 1 page advertisement, 1 page back cover, leaving us with 25 pages of content, so let’s take a look! If you’ve been following my reviews, you’ll know that I’m a pretty big fan of Kobold Press’ Midgard-setting – in fact, I pretty much own almost everything for it. There is a reason for this – it is an unconventional, yet very easy to run setting that is closer in mentality and structure to the medieval than e.g. Golarion. Anyways, one defining characteristic of Midgard most certainly would be the fact that is less Tolkienesque in its racial option array. 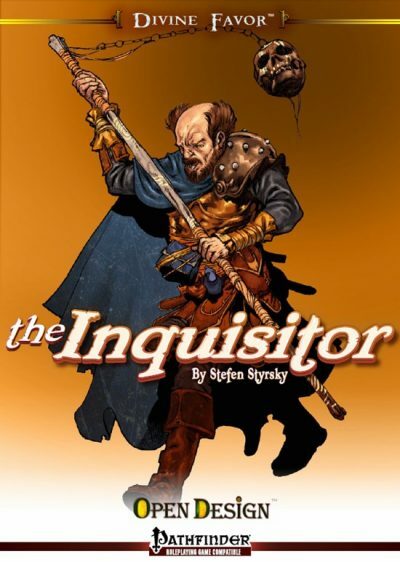 This book, then, would be devoted to translating several of the unconventional Midgardian player options to the context of 5e. Regarding the presentation of the races herein, we begin each entry with appropriately flavorful text, enhancing one’s immersion in the respective entry. As a complaint in that regard, and the only one I can field pertaining the fluff structure, would be that the respective races do not feature sample names. In my book, a specific nomenclature does a lot to endear a given race to me. Anyways, we begin with two centaur-like races, the first of these being the alseid, with bodies of deer and antlers. These fellows increase Dexterity by 2 and Wisdom by 1, are Medium, have a base speed of 40 feet, darkvision 60 ft and gain proficiency with spears and shortbows as well as the Stealth skill. They also leave no tracks within forests and are treated as the monstrosity type…oh, and as quadrupeds, ladders and obstacles like them actually present hindrances. No, I’m not kidding you. This may be the first time that a book actually acknowledges the ladder-conundrum. *sniff* I…kinda got a bit teary-eyed there. In a good way. The midgardian centaurs increase Strength by 2, Wisdom by 1 and are Large monstrosities with a 40 feet speed and proficiency in pike and longbow as well as the Medicine skill. They also have proficiency with their hooves, which deal 2d6 bludgeoning damage. (Ouch – personally, I would have included a scaling mechanism here that increases the base damage to this level at 3rd, but oh well. As a minor complaint: No average damage value for the hoof attack) They also inflict +1d6 piercing damage when charging with pikes and moving at least 30 feet in a straight line, increasing this by +1d6 at 6th and 11th level. Oh, but before you scream OP – they also acknowledge the ladder conundrum, suffer from disadvantage on Stealth and, with a humanoid torso, they do not wield Large weapons, but only Medium ones. Midgard has one of the few iterations of draconic humanoids I do not intensely loathe – the dragonkin and their culture are fascinating and they pretty much replace the default dragonborn. They increase their Charisma score by 2 and have a base walking speed of 25 feet, but do not reduce it due to wearing heavy armor. They also gain darkvision 60 ft. and Proficiency in Persuasion. Beyond that, there are a total of 5 subraces for them: Flame/Fire dragonkin increase Strength by 1 and are resistant to fire damage and gain produce flame as a Cha-based cantrip. Wind/Storm dragonkin increase their Intelligence by 1, gain resistance to lightning damage and may cast shocking grasp as a Cha-based cantrip. Stone/Cave dragonkin increase their Constitution-score by 1, gain resistance to acid and may cast blade ward as a Cha-based cantrip. Finally, the Edjet/Soldier dragonkin may cast shillelagh as a Cha-based cantrip and are resistant to poison damage. They increase their Dexterity by 1. Now elves are a very particular lot in Midgard and thus, core elven options are appropriately codified to represent them. Now the gearforged, the living construct-y race of Midgard is one of my favorites – and it quite amused me to see in the design commentary here that the author came to the same conclusion as I did in my scaling of the gearforged for PFRPG – namely that just going full-blown construct is not the best way of tackling the concept. Indeed, the pdf employs a humanoid (subtype) formula here as well – smart choice! Sorry for the digression, where was I? Oh yeah! 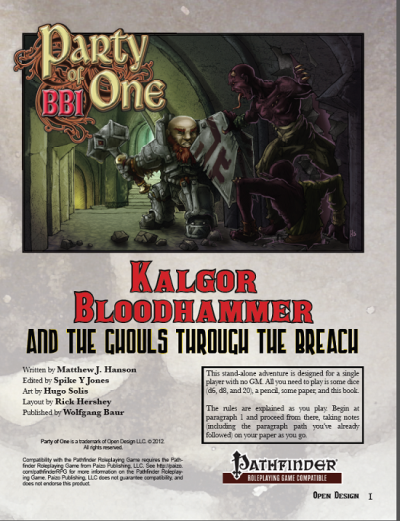 Obviously, gearforged with their everwound springs and soul gems require a tad bit more exposition and the language of Machine Speech is similarly noted, making this section a neat introduction to the matter at hand. 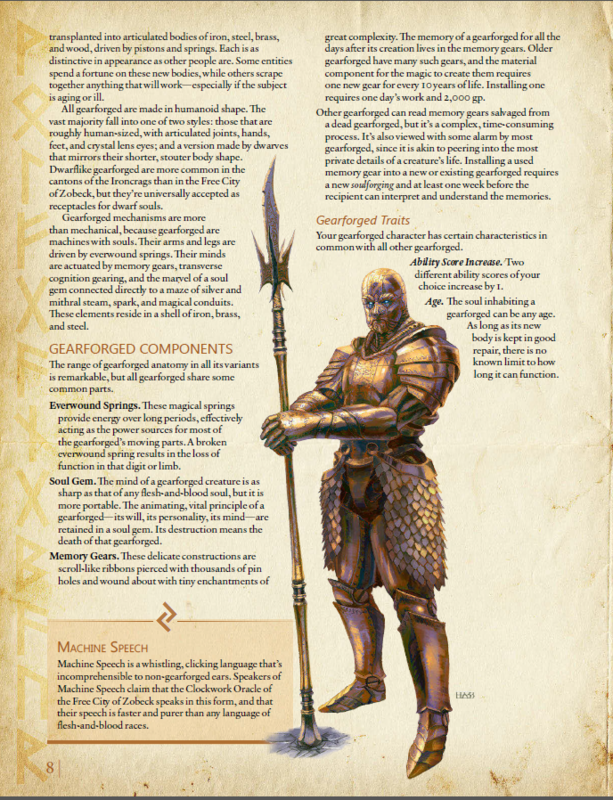 Gearforged choose two ability scores to increase by 1, have a walking speed of 30 feet and immunity to disease, poison damage and the poisoned condition. They may not eat, drink or breathe and thus may not consume potions or gain any associated benefits. They also do not sleep naturally (but magic CAN put them to sleep!). Failing to properly maintain yourself is potentially lethal for the gearforged – each day sans maintenance incurs a level of exhaustion. During maintenance, which is usually taken care of when resting, they suffer from disadvantage on Wisdom (Perception)-rolls… I have *finally* found something to nitpick here: “All exhaustion gained this way disappears after your next long rest.” – this sentence can be problematic, considering that is does not speak specifically about performing maintenance. The intent s clear and functional, though, so consider this just me being a prick. 😉 Gearforged cannot be stabilized via the usual means – instead, they require an Intelligence check or a mending cantrip. As long as your soul gem and memory gears remain intact, you can also have your body rebuilt…which is a pretty amazing angle. Pretty powerful, right? Well…you only gain 1/2 hit points from healing, curing, etc. spells and effects. As a whole…no complaints!! The second race I find myself returning to a lot would be the darakhul – the subterranean, intelligent ghoul-race with its quasi-Roman aesthetics (Can we have a mega-adventure-sequel to Empire at one point? Pretty please?) I digress – they are humanoids with the darakhul subytpe, increase their Constitution by 2 and gain darkvision 60 ft. The race has a bite attack that inflicts 1d6 piercing damage and failure to consume a full meal of raw meat a day incurs one level of exhaustion and may neither heal, nor remove these until you have consumed a sufficient array of meat. They suffer from sunlight sensitivity and gain resistance to necrotic damage and immunity to poison damage and are immune to exhaustion and the charmed/poisoned condition and may not be returned from the dead via regular means, instead, a single-targeted create undead suffices, which adds a pretty frightening proposal to their war effort. As a minor nitpick, immunity to exhaustion and the starvation-based exhaustion RAW contradict each other – while the hunger aspect is obviously intended to supersede the general immunity, an explicit statement would have helped here. 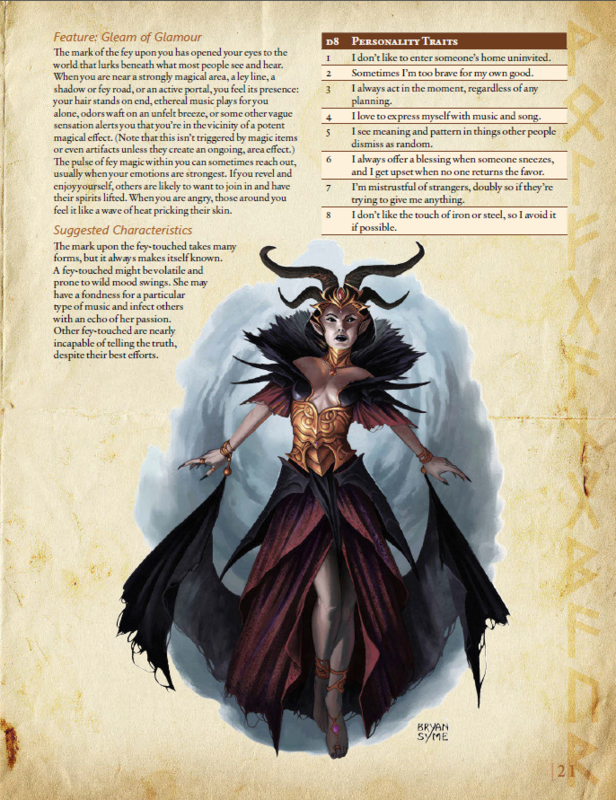 Now darakhul are unique in that they are born from one of the other races – hence, whether you’re Medium or Small, your base walking speed, extra language and +1 ability score increase are all based on that choice: You can play dragonkin darakhul, tieflings, etc. Nice! The kobolds of Midgard increase their Dexterity by 2 and Wisdom by 1, are Small, have a speed of 30 feet, darkvision 60 feet and sunlight sensitivity. They also gain advantage on attack rolls versus enemies within 5 feet if they have a non-incapacitated ally within 5 feet of the target, but only to one attack per round. They also have proficiency with artisan’s tools of their choice. The noble corsair minotaurs of Midgard increase their Strength by 2 and COnstitution by 1, are Medium and have a speed of 30 feet as well as darkvision 60 ft and proficiency with their horns, which inflict 1d6 piercing damage. They may retrace their steps sans error and when charging at least 10 feet towards a target, they inflict +1d6 damage with their horn attack and may shove the target 5 feet as a bonus action, but again, only once per turn. This increases to a 10 foot shove at 11th level and may only be used Constitution modifier times before it requires a long rest to recharge. 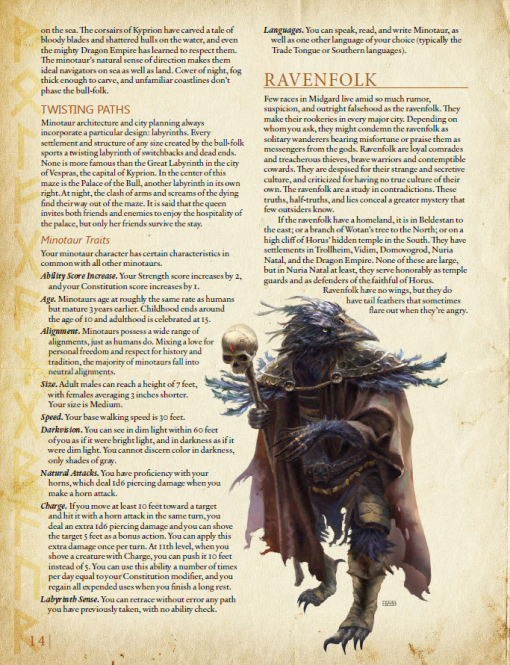 The amazing ravenfolk, also known as huginn and named for Wotan’s ravens, increase their Dexterity by +2 and Charisma by 1. They are Medium and have a walking speed of 30 feet. They gain advantage on attacks versus surprised creatures and may mimic any sound they have heard with Charisma (Deception) versus Wisdom (Insight). They gain proficiency in the Deception and Stealth skills. While I still don’t think we should play shadow fey, they are treated here as a subrace of the elven race, increasing Charisma by 1 and gaining proficiency with rapier, shortsword, shortbow and longbow. They have advantage on Intelligence (Arcana) checks to learn about fey roads and suffer from sunlight sensitivity. They also may cast misty step Charisma modifier times per day (long rest to recharge) when within dim light or shadows large enough to cover the shadow fey. Charisma is obviously the spellcasting attribute here. The trollkin race increases Constitution by 2,a re Medium with a speed of 30 feet, gain darkvision 60 feet and are proficient with their 1d4-inflicting claws and bites. They are proficient in the Intimidation skill and may 1/day, as a bonus action expend a Hit Die as though you had finished a short rest, with the number of expendable HD increasing by +1 at6th level and every 6 levels thereafter. Nice way of depicting regenerative powers sans upsetting balance! Trollkin also have two subraces: Night Whisper trollkin increase Wisdom by 1 and may choose to heed the whispers of spirits to gain advantage on an ability check or save before rolling it. The feature recharges on a finished long rest. Stonehide trollkin increase Strength by 1 and gain +1 AC. The trollkin may be a little bit too strong, though the lack of multiattack or the like keep the natural weapons in check. 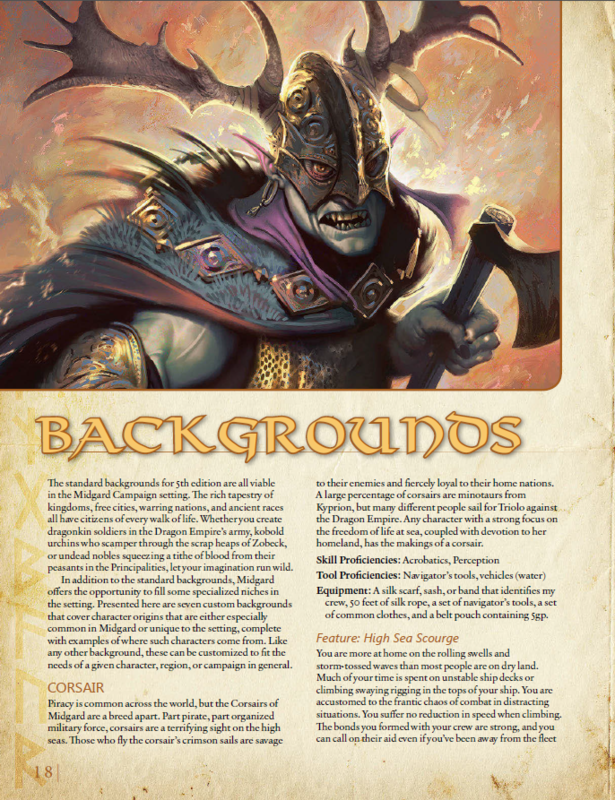 This is not where the pdf ends, though – the pdf also contains several fully depicted backgrounds – corsair, darkling (touched by the ephemeral, dark forces), fey-touched, master craftsman, nomad and raider. 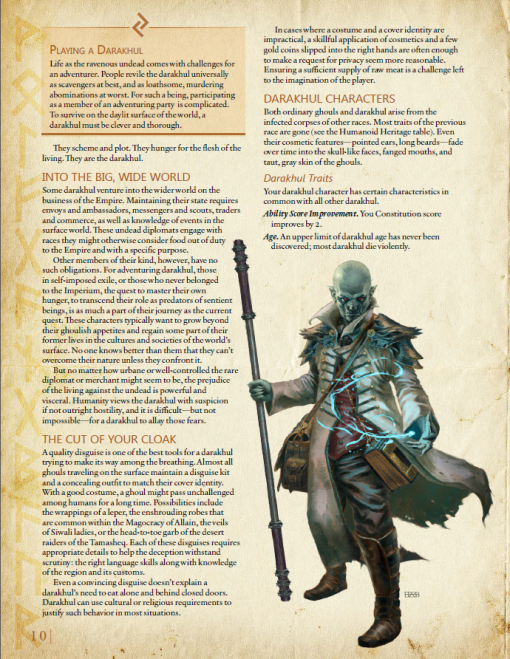 The Guild Artisan variant guild merchant with an alternate feature can be found here as well. The backgrounds are well-crafted, are a nice read and sport relevant features – no complaints! Editing and formatting are very good on both a formal and rules-language level – I noticed no significant violations of rules-language or the like. Layout adheres to a beautiful 2-column full-color standard and the pdf sports absolutely GORGEOUS full-color artworks for the races herein and the some of the backgrounds. The pdf comes fully bookmarked for your convenience. The Four Horsemen’s D&D 5e-specialist Dan Dillon delivers big time in this book. Ladies, and gentlemen, please, a drumroll – for I honestly consider ALL races herein to be balanced (almost) perfectly with the core races. The options herein will work perfectly in ANY D&D 5e game and add some truly amazing options to the fray. 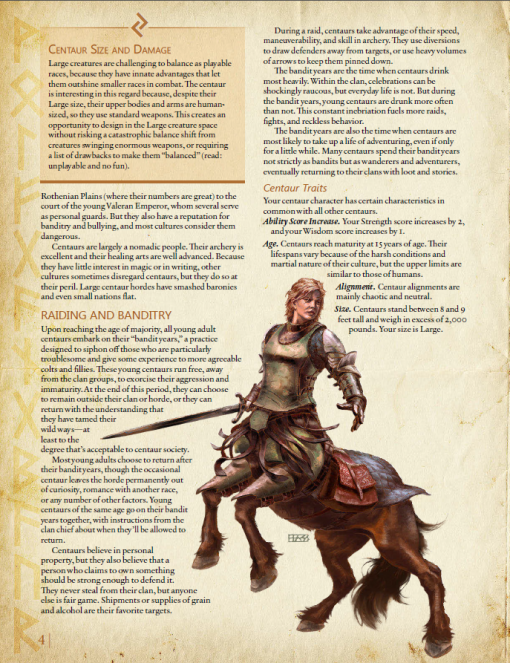 Even traditionally more powerful races have been translated in a way that makes them viable, balanced choices in just about every way…all while maintaining their unique peculiarities. In short: This is an amazing all killer, no filler-supplement of evocative races. Full recommendation without even the slightest hesitation – my final verdict will clock in at 5 stars + seal of approval.